Each team of firefighters participating in our Fight For Air Climb on February 2, 2019 has the opportunity to nominate one member of their team for Top Firefighter. Each firefighter represents the best of their noble profession and is a competitor in the Jacksonville Fight For Air Climb. 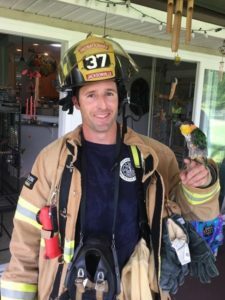 We invite you to learn more about our firefighters and to vote for your favorite….or favorites. Each $10 donation allows you to place one vote and you may vote as frequently as you like. The winner will receive a $500 gift card courtesy of Beard’s Jewelry and a breakfast at his/her station, prepared and served by the American Lung Association staff. We will announce our winner at the Climb. Why did you choose to become a firefighter and what do you love most about your job? I came for the excitement and stayed because of the brotherhood. This is my fourth and final fire department that I have worked for. I’m originally from Long Island, and if I had stayed up there I would have ended up being a police officer like most of my cousins. I chose the career because it meant that I could serve others by doing something that I love. After going through paramedic school and completing my ride along requirement, it was never an option of ‘if’ I became a firefighter, but when. Being on the job brings a lot of responsibility to be a role model and that results in the obligation to constantly be working towards being a better fireman. I like that it requires a team to work towards the greater good, and out of those relationships comes a heck of a family. I love the people I work with and learn from every day. 1. 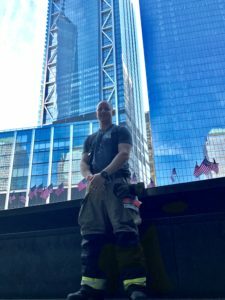 I had the honor to fundraise and climb 80+ flights in NYC for 9/11 first responders who are still dealing with the health effects of selflessly entering the towers to save others.